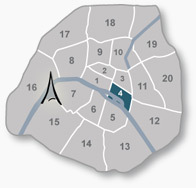 This apartment is located on the 3rd floor via stairs or elevator on rue Bourg Tibourg right in the heart of Le Marais. A spacious living & dining room with 3 large windows facing the street. Wooden beams and high ceiling. Sofabed for 2 people and dining table for 4. Cable TV & internet connection.Fully equiped kitchen with small breakfast table. Bedroom with double-bed and several closets. Bathroom with shower and separate WC. This apartment has all the charm of Le Marais. * agency fee not incl. This apartment is located steps from the Metro St Paul in the heart of Le Marais. Within 5 min walk of Ile St.Louis, the Picasso Museum, the Carnavalet Museum, Places des Vosges, Place de la Bastille and rue de Rivoli. In the close neighborhood, there are traditional bakeries, cheese shops, wine stores, gorgeous flower shops, huge traditional Bastille market and the legendary stationary shops of rue du Pt.Louis-Philippe. The European Photography Museum, the Shoah Museum and the well-known rue des Rosiers are also close to the apartment. Bus-lines 96, 69, 76 and 26 city-sponsored bikes, (the famous velibs) at your disposal - just close to the apartment. Enjoy the churches of St-Gervais-St Protais and St Paul as well as the Antique Shops of the Village St-Paul. Many restaurants, cafés and bars in the neighbourhood. Spacious living & dining room with sofabed for 2 people, coffee table, armchairs and a dining table for 4 people. Wooden beams and three windows facing the street. Cable TV & internet connection. Bedroom with double bed, bedside tables & lampes, chest of drawers and closets. Two windows facing the street. Wooden beams and wooden floor. Fully equipped kitchen with refridgerator, freezer, stove, washingmachine, coffee machine and all kitchen utensils. One window facing the courtyard and small table for breakfast. Bathroom with shower, sink towelrack and separate WC. There is also a second WC in the entrace of the apartment. This is a terrific apartment - roomy, clean, great comfortable bed. There is an elevator if needed, particularly nice when arriving with baggage. There is one full bathroom and one half bath, and the apartment would be quite big enough for a family. The location could not be better. In the Marais, on a side street, with grocery store across the street and boulangerie right at the corner. About midway between the metro stops at Hotel de Ville and St. Paul, easy walking to the Pompidou, the Picasso Museum, and Ile St. Louis. Sadly, the days we were in Paris this time were very gray and gloomy, and despite the large windows the apartment felt a bit dark. The bedroom windows face the street, so there is some street noise late at night and early in the morning, but not a lot. The information given concerning the appartments have no leagal commitment. It might be subject to errors, omissions and it could be changed at any time without any prior notice. All measures are approximate.